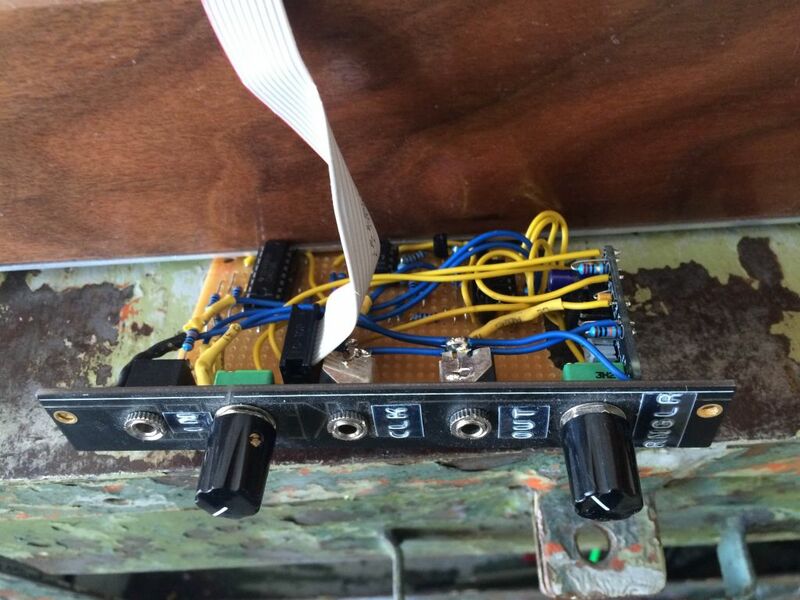 Just of out of curiosity: anyone built just the Rungler section of the Benjolin / Blippoo Box as a standalone module, with inputs for oscillators / other audio sources? I think it could be interesting to be able to patch a Benjolin-esque type thing from scratch, or as a source of randomness. I know there's a 5U module called a Rungler, but this appears to be a more complex module. I did exactly this. I built mine on stripboard, which was entirely doable. It's great to use as a cv or noise source. Nice! Any chance you could share the schematic or stripboard layout? If you want to keep the circuit simpler, you could leave out the XOR feedback loop. Depending on your oscillators, you could go lunetta style and have only the IC and passively mix the output bits with resistors. You can use other shift register chips too. I prefer the 4015 because I already have a ton of them and theres two on one chip at the comprise of less stages. What part? The white of the walls? Will this work on both +/-12v and +/-15v? No, this works off +/-9V because the 4021 accepts maximum 18V power. You could quite easily figure it out for unipolar power, of course. I used the schematic that was posted above, fed through 78L09 and 79L09. I added a comparator at the inputs, running from the +12/-12, then I divide down the voltage in order not to overload the 4021. Yeah, comparators for p1 and p2, so you can feed any waveform, but why not running them from +9/-9? This approach also ensures the 4021 is only fed voltages between -9 and +9. So he meant leaving out the BC547 and the portion of the TL074 to the right of the 4021 etc and having the input directly into pin 11 on the 4021 to simplify it? Also would anyone mind explaining the comparator stuff? Comparators are very simpe circuits, to put it very plainly, in this circuit they would be fed e.g. with an audio signal and every time that signal exceeded a certain preset level or crossed from neg. to pos., they would produce a clock/digital signal, which the 4021 needs on both his inputs. tds, where do the pots go in relation to the casper schematic (and useful values)? Here's a schematic I posted recently for an instrument that incorporates a bare bones Rungler. Just ignore the Blender section at the bottom. Runs fine on +/-12V. 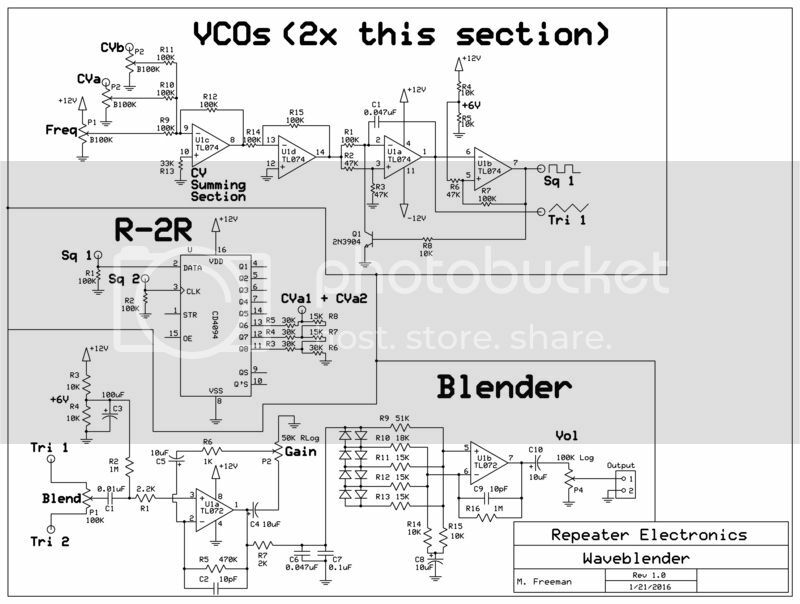 The feedback path between the shift register and the VCOs in combination with the delay imparted by only using the last 3 stages of an 8 bit shift register in the R-2R ladder is what makes the Rungler chaotic. I've found the XOR gate to be less important. The Strobe input on the CD4094 would be an interesting candidate for an external control input via comparator that would still preserve the things that make the Rungler a Rungler. I much prefer the CD4094 to all of the other CMOS shift registers. They're extremely easy to work with, and in addition to the parallel outputs, they have the two serial outputs that you can use to either send the data elsewhere, run through a differential amplifier to get audio, etc. etc. I also find using an R/2R network like the Bourns ones, simplifies things, and saves space on the PCB. If it's just digital noise though, the CD4006 is much better, but it's no longer made. Still easy enough to get, but I'm using them less and less because of this. If you use a CD4070, you've got multiple XORs that you can route all over the place (via switches,) and that can greatly increase the amount of patterns that you can get out of the shift register. Not sure how valuable a single XOR is for doing a spot of Rungling. I have a similar circuit to all of this, and I'd be happy to post it here as soon as I get home. It also includes multistate LED drivers for each shift register stage, comparator for the data input, etc. I'm actually moving to CPLD programmable logic ICs for this sort of thing, so I'd be happy to toss up all my CMOS logic stuff that's sitting around currently if anyone's interested. Cool, wasn´t on my radar yet, thanks! I've also been thinking about stand alone, bare bones runglers. Probably on strip board. Fascinating things, shift registers. I got a benjo, turing machine and a modified noisering. ...The feedback path between the shift register and the VCOs in combination with the delay imparted by only using the last 3 stages of an 8 bit shift register in the R-2R ladder is what makes the Rungler chaotic. Agree, but really makes the whole chaotic core chaotic. If there is true chaos in the mathematical sense in this circuit, I really don't know but it sure sounds/behaves like other "true" chaotic circuits to me. And they are fun to play with. A few thoughts, observations and questions. It seems all Rob's runglers are a bit different. I think the two runglers in the blippoo box uses shorter delays (1x 4015 = 2x 4 bit registers using 3 bits each; check his article) possibly without xor or other logic feedback. A shorter register just has to impact the kind of patterns you'll get and overall system behaviour. Not to mention two cross fed runglers instead of one xor feedbacked. Don't write of XOR feedback though. It has the curious property of always giving a moving output pattern even without change in input data, unless data in the register was all 0 or all 1 to begin with and input was then only 0. Otherwise, if input is a constant 0 this will make the pattern loop as was, and if input data is a constant 1, you'll get a loop of ever inverting data (more change). Even if the register contained all 0's or all 1's. I just can't make up my mind if I should do a +\- 9V supply or a single 12V for the CMOS. @tds, where did you set the comparator trip points? And what are you mostly hooking the rungler up to? I'm assuming you refer to the picture I posted of my module. The top pot simply sets the tripping point for the comparators on both of the inputs. This way I can use unipolar clocks, or bipolar signals like the complex waveforms from an E350. Its a voltage divider for the opamp input so the value doesn't matter much I guess, you could use 50k or 100k. The bottom pot is an attenuverter on the output - here I use fonik's chicklet. I typically patch mine up with the two oscillators of my DPO but I also sometimes use slower clocks to generate quasi-chaotic melodies or CV. I'm using the Xilinx XC9500XL, which is 5V friendly, and has plenty of power for doing the types of things I like to do. It's SMT, but still DIY friendly. Just got the programmer and dev tools set up. Also I've got a tiny breakout board for it laid out that contains one of these, JTAG header, and voltage regulation that then goes to two rows of pins. (so it's basically like a large DIP package. I'm going to get a ton of them made. This little PCB then piggy-backs on whatever the main board is for a given module. The first module I'm working on is kind of like what the NoiseRing would be with the expander that Grant had planned for it. I actually simplified some parts, but expanded out into others. I'm planning to use a much larger (16 bit) shift register with movable taps. It will have audio and logic IO, the ability to use anything as a data source for the register, configurable logic operations to drop into the data loop at different points, and possibly more features. Also, after I decided to use a V/Oct VCO as the main clock, I started thinking I might add some table-lookup phase distortion type things to the VCO portion, and then those tables could also be read into the shift register to do interesting things. That will barely scratch the surface of what one of these ICs will do, but it will make a good (and manageable) first project. I really like short registers (or less bits used on larger ones) where audio is concerned. You can get some really nice sounding Atari type waveforms (pulses) out, which when clocked by a VCO, you can then play musically. They also make excellent lo-fi drum sounds. Shorter registers also make cool repeating patterns for gates or CVs if you convert them to voltages. Very cool stuff! @J3RK, Thanks, makes me even more curious about shorter registers. Re CPLD, Interesting as I tought it would be! I've been trying to get my head around FPGAs and such, dreaming of maybe a programmable do it all replace any CMOS based module. Still don't understand the fundamentals. So, a super novice question. Can one actually clock whatever logic one defines inside the chip completely from the outside, how fast or slow as one wish? I mean, can one program a flipflop and have the timing expectations of a hardware one, no actual sampling being involved?